E.D.R.P.G. 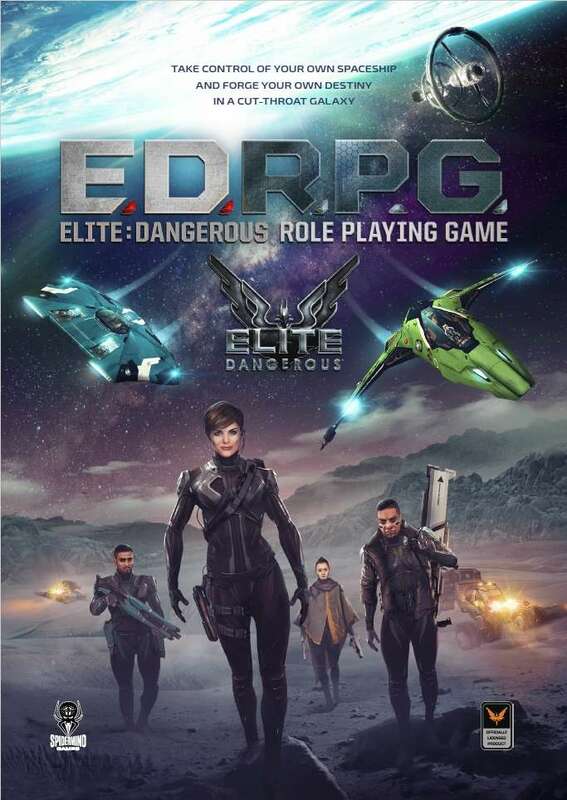 or Elite: Dangerous Roleplaying Game is a roleplaying game based on the computer game of the same name, a rare thing, a pen and paper roleplaying game based on a computer game. Developed by Spidermind Games and published via Modiphius Entertainment following a successful Kickstarter campaign, it presents a far future Science Fiction setting in which owning your spaceship and space travel is cheap—and so is your life as the police shoot first and might ask questions later, entire systems are overrun with space pirates, and corporate interests dominate the galaxy. Into this free-for-all capitalist paradise come the player characters, hotshot pilots with the best customised ships on a budget, transporting cargo from space station to another in the hopes of making profit enough to upgrade every aspect of their ships before upgrading to an entirely new model of ship! This is, of course, the classic ‘Lone Wolf’ campaign as played in every version of the computer game, Elite, right back to the 1984 original, including the most recent version of the game, Elite: Dangerous. Now where Elite: Dangerous and Elite: Dangerous Roleplaying Game differ from the original, is that Elite: Dangerous is not just a lone player experience—it is a MMORPG or Massively Multiplayer Online Role-Playing Games which can be played together, and Elite: Dangerous Roleplaying Game offers exploration, espionage, and military campaigns as well as the Lone Wolf campaign. All this is played out against a persistent universe which is constantly growing and aspects of this are present in the Elite: Dangerous Roleplaying Game. Elite: Dangerous Roleplaying Game supports this with rules for combat in person, planetside in vehicles, in space between the player characters’ and enemy ships—pirates, slave traders, bounty hunters, and sometimes the police; stats for classic spaceships from the computer game which can be customised and upgraded; trading in and out of the game; and tables for both random star system and adventure generation. All of which comes packaged in a bright and cleanly presented hardback book which is nicely illustrated and written. The starting point in Elite: Dangerous Roleplaying Game is the character, which in the game is defined by his Rank, Skills, Backgrounds, and Karma Abilities—there are no attributes such as Strength or Intelligence as skills cover everything. Rank determines the maximum levels a character can have in his skills as well as Endurance, Karma Points, and Karma Capabilities or Enhancements. There are nine Ranks, from Harmless to Elite. Skills are expressed as percentages from which a bonus is derived; Backgrounds add a little colour, but mostly provide bonuses to skills and a possible Enhancement—an improvement which sets the character apart from ordinary folk; and Karma Capabilities are little tricks characters can pull to get out of sticky situations. For example, the Hacker Background provides Computer +20, Security +10, and the Natural Genius (Computer) Enhancement. In the case of the Natural Genius (Computer) Enhancement, it raises the cap on maximum skill level for a Rank. A Karmic Capability is something like ‘Spin Wildly’, a spaceship combat maneuvre which costs 5 Karma to use and grants a +5 bonus to a pilot’s Spaceship Defence against an attack that would hit his ship. To create a character, a player selects or rolls for—tables are provided for the latter—four Backgrounds, selects three Karma Capabilities, improves ten skills, and then selects his starting spacecraft from a choice of four, plus variants. These include the Sidewinder FD-4, the Eagle Interceptor MR1, the Hauler Hatchback Zeta, and the Adder Cornucopia. Experienced players are given the option of spending a set budget on a basic design and customising it. Each character also comes with a standard set of equipment plus some other items depending whether they have certain skills. It should be noted that all characters receive the Pilot Trained Background and the Escape Death Karma Capability for free and in addition to the ones selected during character creation and that all skills start at ten. Our sample character is Rise ‘Roundhouse’ Rownels a medical graduate from 5714 Coronae VII. He expected to have a career in medical science which would last his lifetime, but when he blew the whistle on the unethical activities of his employer, Kerensky-Jadin Technology GmbH, he was blackballed from the profession and lost his medical licence. Forced to turn to other employment, he found work as a boxer and a private eye. A number of missing persons cases led him offworld and now he knows he wants to follow up on those cases. For that he needs a spaceship and the settlement from his wrongful dismissal case just got him the money he needed for that. Rise ‘Roundhouse’ Rownels is a rookie pilot, but in a brawl or after you have been punched out, he more than punches above his weight. Karma Capabilities: Diligent Medic, Escape Death, Slam, Liar, Liar! Perhaps one of the most interesting Backgrounds to choose from is ‘Partner’. Whether a Best Friend or Boyfriend/Girlfriend, Business Partner or Husband/Wife, this is an NPC who accompanies a player character on his missions. Controlled by the Game Master, this NPC is not quite equal to a player character, but have skills, Backgrounds, and Enhancements and can make use of a player character’s Karma Capabilities. It is possible for such an NPC to be a pilot like the player character, but either way, the Partner is a player character’s companion who can help out on missions, make repairs to ships, and so on. Having a Partner necessitates choosing a spacecraft capable of carrying both the player character and his companion. The mechanic at the heart of Elite: Dangerous Roleplaying Game is straightforward enough. A player rolls a ten-sided die and adds a relevant Skill bonus to equal or beat a target number. Rolls of one always fail, but rolls of ten always succeed. A Skill bonus is equal to one tenth its percentile value, so for example, a Rise ‘Roundhouse’ Rownels’ Skill bonus is +3 when using Fighting, but +4 when using Science. It should be noted that since all player characters have a minimum of ten in each skill, they always have a minimum Skill bonus of +1 in any skill. Guidance for Difficulty Number is given for realistic difficulty or relative difficulty, the latter taking into account the average player character Rank, the former not. Thus under realistic difficulty, the average Difficulty Number is between nine and eleven, representing a challenging task for a professional, whereas under relative difficulty, it is seven at the Rank of Harmless, eight for Mostly Harmless and Novice, and so on… The advantages and disadvantages of both are discussed in detail, although Difficulty Numbers as a topic are not really explored until two thirds of the way through the book. Whether successful or not, this will earn the character a tick for the skill used. At the end of an adventure, each tick enables the skill to be increased by one up to the Skill Cap for the character's current Rank, but only one tick can be earned per skill per adventure. Given its origins, it no surprise that combat plays a big part in Elite: Dangerous Roleplaying Game, spacecraft combat in particular. Personal combat is not particularly complex, being only covered in a few pages. A player character gets a move and an action per round, but can also defend himself as necessary. One interesting touch is that if a player character successfully parries a Fighting or Melee attack, then he can counter-attack. This is essentially a free action. Space combat is really dogfighting, with player characters taking an Equipment Action—assign a bonus if the spacecraft has the right equipment, deploy chaff, or deploy mines; Recharging their spacecraft’s shields; and then taking a Combat Action. The type of Combat Action depends upon the range, for which Elite: Dangerous Roleplaying Game has just the two—‘At Distance’ and ‘Up Close’. The former means that a spacecraft is at the edge of the battle, or just beyond it, whereas the latter means that the spacecraft is involved in the heat of the battle. ‘At Distance’ enables a pilot to play Chicken, Flee, Joust, Pass, Snipe, or Strafe, whilst ‘Up Close’ a pilot can attempt to deliver a Broadsides, Disengage, Dogfight, Flight assist off, Pass, and Ram. These maneuvres determine both how a spacecraft is going to move and how many weapons her pilot can fire. In general, a pilot and his spacecraft really only gets to fire once per turn, but with the Dogfight manoeuvre, multiple spacecraft can get involved and this means multiple manoeuvres and potentially, multiple chances for a pilot to fire his weapons, each time on different opponents. Once a hit is scored, damage needs to overcome a target ship’s shields and then it is applied to the ship’s hull. If a ten is rolled on the to-hit roll and the damage is sufficient to reduce the target ship’s shields to zero, then the target ship suffers damage to both the hull and one of its components. Again, the space combat rules are covered in only a few pages, but presents a chaotic free-for-all system in which the player characters really get to mix it up. They are followed by rules for vehicle combat, which are again relatively simple and straightforward. After all this, only now does Elite: Dangerous Roleplaying Game start present any kind of background against which the game will be run. Even then, it does not open with the background to the setting, but rather with a guide to a player character’s, or rather, a freelancer’s, first spacecraft. Delivered as a legally mandatory introduction by a representative of the Faulcon Delacy corporation, it is the first piece of colour fiction to appear in the book and it is just ever so knowing and thoroughly engaging and enjoyable. It is followed by a guide to the galaxy and the major powers—the Federation, the Empire, the Alliance, and independent worlds—which although written in the same engaging style, it really is a bit short at nine pages and barely 2% of the book for a Game Master to write adventures for. On the plus side, it means that the Game Master has a lot of freedom to write adventures, but compared to other Science Fiction roleplaying games, the background is slight. Following this is a third lecture, a guide to ‘Being a Good Citizen’, how to act and what to expect as a newly qualified pilot out there in space… Given the simplicity and shortness of the rules, it seems odd to have this very short chapter of background after those rules and not before, at the beginning of the book. Technology wise, Elite: Dangerous Roleplaying Game presents a setting where both Faster-Than-Light travel and ownership of personal spacecraft is common. What is not common is the generation of gravity, so player characters are equipped with mag boots, whose use can play a big role in zero-g combat. In addition to listing all of the personal equipment, Elite: Dangerous Roleplaying Game does a nice thing with its personal weapons. It gives generic stats for auto pistols, laser pistols, submachine guns, assault beamers, and so on, but it treats non-generic models as both different and rare, so that whenever a player character gets hold of one, it is special. Besides all this, cybernetics are also given, but once installed, if they are too obvious, they have a deleterious effect upon a character’s Karma points and his social skills. Likewise, heavy armour has a similar effect, but conversely, wearing the right clothing can have a positive effect. From the Adder, the Anaconda, and the Asp Explorer to the Type-9 Heavy, the Viper MK III, and the Vulture, Elite: Dangerous Roleplaying Game details some sixteen spacecraft models and their variants. All taken from the computer game, this provides plenty of standard models to buy off the shelf—or upgrade to—but also the rules to allow a player character to modify his ship according to his taste and design. There are lots of options here and should support the player characters and their equipment progression in the long term, although this is very much a set of mechanics that is best handled between adventures. Unlike the section on spacecraft, the section on vehicles just lists various models without the rules to modify them. The Game Master’s section covers the basic rules as well as game types—military and police, espionage and intrigue, exploration, Lone Wolf, mission-based, and sandbox games. The standard game type is, of course, the Lone Wolf, a la the Elite: Dangerous computer game. They feel a bit short, more of a good start than overall helpful, and the Lone Wolf game type has issues of its own as we shall see… This section also provides further discussion about the rules, including handling combined personal, spacecraft, and vehicular combat, as well as handling trade during adventures. Again, this is kept fairly light, but really the default set-up is for trade is handled between adventures as can be asteroid mining, exploration, and bounty hunting. This enables a player character to earn some income between adventures and essentially moves what might not very interesting to play through off-stage. Then, it gives the Game Master the perfect means to take the player characters to another location ready for an adventure, to introduce an NPC or a threat, drop a clue, and so on, thus leading into the next adventure. In general, those threats come in three scales—individual, vehicle, and spaceship scale. These include soldiers and mercenaries, criminals, police and security, assassins, as well as alien animals and drones. These are fully statted out and described, all ready to use with the ‘Random Generation System’. This set of tables can be used to create two things—star system and missions or adventures. There is no adventure in Elite: Dangerous Roleplaying Game, but there is the means to create plenty. Each mission type is broken down into three or four types and accompanied by five possible twists, so there is a good mix here. What the combination of the extensive list of opponents combined with the star system and mission generator is model the procedural generation of game play in Elite: Dangerous. Now a roleplaying game needs slightly more rational rationale to its play, so the use of these tables requires an experienced Game Master or a bit of preparation beforehand. Rounding out Elite: Dangerous Roleplaying Game is an extensive set of forms to help record the details of a game. Physically, Elite: Dangerous Roleplaying Game is an impressive book. It is a relatively light read and it is extensively illustrated in full colour. Now what it lacks is an index and that is a major, not to say, inexcusably frustrating, omission by modern standards as it will seriously hamper the use of the book. Now the book is well organised and the colour of the pages is nicely selected to make certain sections stand out, but there is no denying that there should have been an index. Full examples of character generation, general play, and space combat would been useful additions too, especially for anyone coming to the roleplaying game from the computer game without any experience of having played a roleplaying game before. There are several things that Elite: Dangerous Roleplaying Game is missing. One is sufficient background that would help impart the feel of the setting and help a Game Master write scenarios. The second is the lack of a map of the galaxy. It need not be detailed, but it would have been nice to learn the geographical relationship between the various powers. The third is the absence of an index, which points to certain lack of professionalism as an roleplaying game should have index. The fourth is a scenario, which will be something of an issue for anyone coming to the roleplaying game from the computer game without any experience of having played or run a roleplaying game before. Admittedly, had there there been a scenario, what type of game should it have covered—military and police, espionage and intrigue, exploration, Lone Wolf, mission-based, or sandbox? This is all despite the fact that the mechanics and the means to play Elite: Dangerous Roleplaying Game are lightly handled and relatively simple to play, and thus easy to learn and suitable for those new to roleplaying. Ultimately, what Elite: Dangerous Roleplaying Game cannot do is reconcile the Lone Wolf campaign play of the Elite: Dangerous computer game with the collective needs and set-up of the party in a roleplaying game and this is why the other game types are stronger and easier to use. It may need more exploration in a future supplement if the Lone Wolf game type is be fully realised as a possible campaign set-up for Elite: Dangerous Roleplaying Game. Nevertheless, despite these issues, what you have in Elite: Dangerous Roleplaying Game is a relatively light, Science Fiction roleplaying game which does its very best to model the Elite: Dangerous computer game. It might not provide as much background as it should, but it certainly provides the means and the mechanics for the players to take their freelancers to the spacelanes and trade their way to fame and fortune. 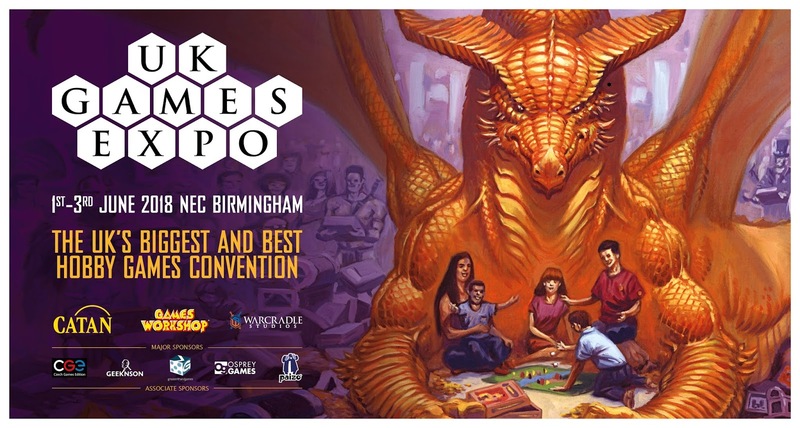 Spidermind Games will be at UK Games Expo which will take place between June 1st and June 3rd, 2018 at Birmingham NEC. This is the world’s fourth largest gaming convention and the biggest in the United Kingdom.